Alex Pillai’s very aptly named 'Victim', a gritty urban thriller set in London’s East End, explores the notion of the victim becoming the victimiser, covering familiar ground but with enough charm and action to inject some excitement into the well-worn theme. Ashley Chin (also co-writer) stars in the lead role as Tyson, a talented, intelligent young man who has been left to raise his teenage sister, Nyla (Letitia Wright) after being abandoned by their substance-addled mother. Struggling to cope in the face of his mother’s debts, Tyson resorts to armed robbery as a means of getting by, working with a group of friends to target a series of wealthy marks, using the girls, Davina (Anna Nightingale) and Charmaine (Shanika Warren-Markland) as a honey trap. The arrival of Tia (Ashley Madekwe) – Davina’s innocent and eminently middle-class cousin from the countryside – creates tension within the group, however, as romance begins to blossom with Tyson, inspiring him to break the cycle of violence and renounce his life of crime, until unfortunate circumstances conspire to draw him back in. When reviewing 'The Man Inside' recently (a film belonging to the same urban genre, with a not-dissimilar plot) my principal niggle was the humourless script and forced dialogue – 'Victim', by contrast, demonstrates how to get it right, with an authentic urban lexicon and plenty of humour and banter to offer light relief in the face of the darker elements of the tale. Although the central plot– Tyson’s quest for redemption and a better life – is fairly predictable, there’s a sense of pace and tension that keeps the story interesting, aided by Ashley Chin’s charismatic performance and a number of smaller sub-plots that invest the minor characters with welcome depth. The film starts to go off the rails slightly towards the end, due partly to some terrifically ham-tastic acting from Jamie Davis as Malcolm, Tia’s token psycho ex. 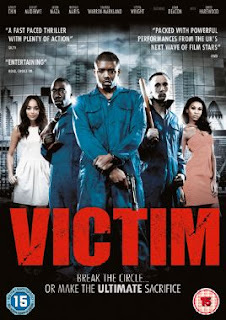 However, on the whole 'Victim' is smart, emotionally engaging and enjoyable – a solid addition to the urban genre. 'Victim' will be released on DVD in the UK on 1 October. Pre-order at amazon.co.uk.